An ambitious, complex, at times unwieldy play that dramatizes the relationship between humans and the digital sphere as much as the relationships among its characters. Loren Noveck reviews. 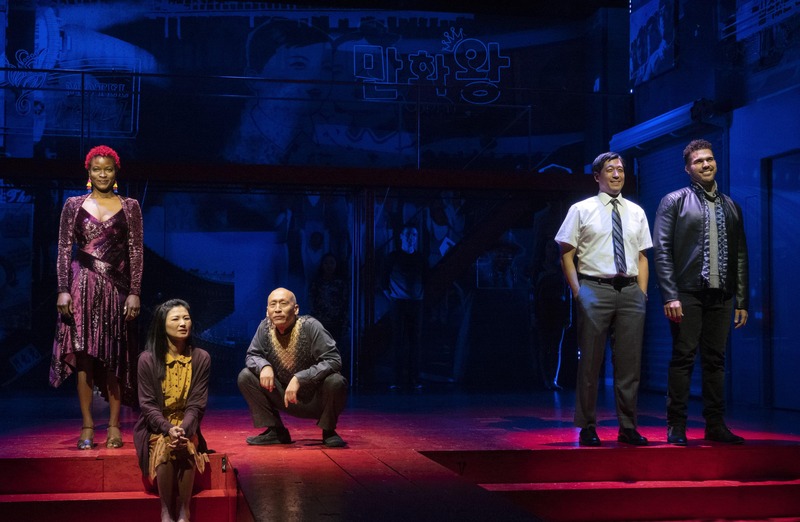 Lulu Fall, Michelle Krusiec, Francis Jue, Peter Kim, and Joél Pérez in the New York premiere of Wild Goose Dreams, written by Hansol Jung and directed by Leigh Silverman, running at The Public Theater. Photo: Joan Marcus. The story of Wild Goose Dreams is stripped-down, simple: two lonely people, separated from their families, find each other and begin a romance that isn’t in the end enough to paper over the fissures in those families—or protect them from the dangers and cruelties of the world. But on the level of form and theme, Hansol Jung’s play is an ambitious, complex piece of writing, trying to devise a theatrical idiom to tackle the always-already-digitally-mediated way we live in the twenty-first century, as well as examine the tensions in cross-cultural relationships, plumb the psychology of defectors and survivor’s guilt, navigate the way we use metaphor to make sense of our stories and our dreams, and even peek behind the closed borders of North Korea. (I found the form a bit more intriguing than the content, in the end.) It aims, with mixed success, to combine social satire with gentle romance, ironic O.-Henry-esque tragedy, and even a little horror; it shifts between the abstract and the emotionally realistic. Guk Minsung (an achingly vulnerable Peter Kim) is what is known in South Korea as a “goose father”: to use the play’s citation of Wikipedia Korea, “the goose father is a Korean man who works in Korea while his wife and children stay in an English-speaking country for the sake of the children’s education.” Seven years after his wife and daughter moved to Fairfield, Connecticut, Minsung lives in a tiny room meant for a student, works long hours, and barely knows how to talk to his family. He tries to find on the internet the connections he’s missing in life—friending his daughter on Facebook and Instagram; joining a dating site as “MrGooseman”; playing Angry Birds; seeking cheap flights to Connecticut. Yoo Nanhee (Michelle Krusiec), a North Korean defector who swam across a freezing cold river four years ago to get away from her birthplace, has a menial South Korean government job, not a lot of friends, and a desperate desire to talk to the father she left behind. When a shady broker claims to have smuggled a phone to her father, she has a conversation that she fills with lies to avoid disappointing him—lies she wishes were true, about her success and her happiness and her marriage and children. And then, desperate to turn those lies into truths, she accepts a free trial for a month of internet dating, and meets Minsung. While the story builds tentatively, the piece’s formal and structural innovations jump out immediately—particularly Jung’s approach to dramatizing both the overall swirling maelstrom of the internet and the individual ways both Nanhee and Minsung interact with the digital world. A seven-member ensemble serves as in effect a Greek chorus of the virtual world, vocalizing every search query, pop-up ad, Google alert, meme, and—more poignantly—every check to discover no new emails/Facebook messages/chat requests that Nanhee or Minsung view over the course of the play. Each has an individual avatar (Lulu Fall and Joél Peréz) narrating their actions on the internet; the other five embody the sea of results and incoming information. To me, the individual avatars are a less compelling device than the neverending, polyvalent sea of swarming data represented by the chorus at large. It’s a counterintuitive choice to use humans, rather than projections or some sort of interactive media, to stand in for the internet (and in fact, when the show does need projections, it deliberately does them “old-school,” with an overhead projector or other static slides), but it’s a very effective way of conveying the intimacy and seductiveness of the digital sphere, and director Leigh Silverman’s staging conveys both the menace and the “stickiness” of the internet. Minsung, in particular, does have more intense relationships with his media than with the humans in his life (to be fair, his wife and daughter do currently live for him essentially on the internet—and two members of the chorus, Kendyl Ito and Jaygee Macapugay, play wife and daughter when necessary). And the device also allows both Minsung and Nanhee to be sucked into non-real worlds that distract them from being able to simply be with each other; they’re more involved with the digital, imagined, or remembered worlds than with the one they live in now, and it saps their connection. There’s a flatness between them that’s only slightly mitigated by tenderness. And none of this even begins to touch on the ways Jung depicts the cultural gaps between Minsung and Nanhee, the ways in which even in a common language they’re unable to recognize each other’s jokes, or really understand how the other thinks and feels. But there’s still so many things to enjoy, ruminate on, appreciate, and startle at. Wild Goose Dreams is worth seeing for its innovative approach to our twenty-first-century identities and its dreamscapes even if it doesn’t catch all the balls it throws into the air.